Seahawks receiver Doug Baldwin, who hasn't missed a game since 2012, said he feels 80-85 percent after sitting out most of last month. Baldwin remains limited in practice this week, only taking part in individual drills. But even that, he said, is much better than simply watching from the sidelines, as he has been forced to do most of the last month. But somewhat ominously, the time off hasn’t completely fixed Baldwin’s knee, with the receiver saying it’s something he will have to deal with all season. Seattle coach Pete Carroll said only that Baldwin had “a knee’’ issue when he announced earlier that Baldwin would be sidelined for most of training camp with the intent of being ready for the regular season. Baldwin has been one of Seattle’s most durable players, having missed only two games since arriving in 2011. Those two absences occurred during Baldwin’s second season in 2012, when he sat out one game with a shoulder injury and another with an ankle issue. Baldwin has the fourth-longest active streak of consecutive starts among NFL receivers, with 88. Baldwin then took part in the first two days of training camp before it was decided he would sit out to let the knee heal. “First two days of camp I realized that it wasn’t where we wanted it to be and in order for me to sustain that level of play being able to express myself athletically the that I wanted to it was time to do something more serious,’’ he said. Baldwin, who turns 30 next month, has three years remaining on a four-year, $46 million deal signed in June of 2016. He enters the season fourth in team history in receptions with 443 — 28 behind John L. Williams for third — and he’s the acknowledged leader of a receiving corps that has otherwise undergone a pretty significant makeover the last few years. The Seahawks figure to keep at least five receivers — Baldwin, Tyler Lockett, free agent signees Jaron Brown and Brandon Marshall, and 2017 seventh-round pick David Moore. Amara Darboh, a third-round pick last season, is vying for one of the other spots — as are a host of other free agents, notably Keenan Reynolds who primarily plays in Baldwin’s slot position. 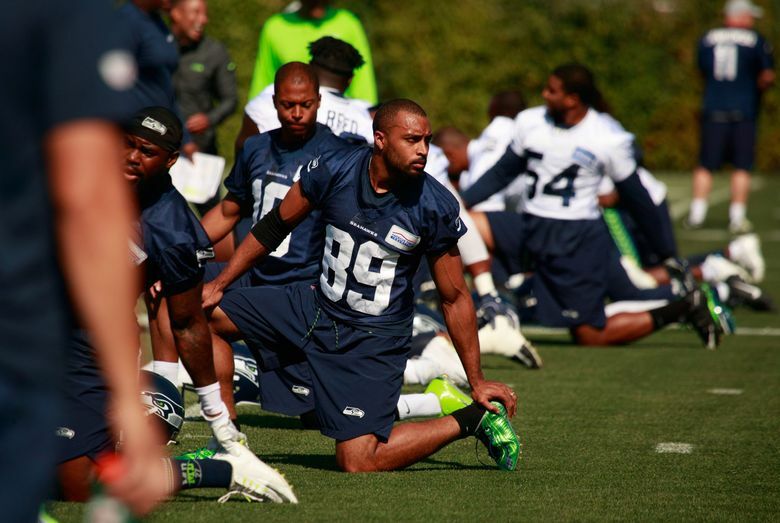 Baldwin hopes when he does return that it will be seamless despite having no preseason game action and few reps.
Seahawks receiver Doug Baldwin talks about returning to action after sitting out much of training camp.